Tampa Bay Downs is an American Thoroughbred horse racing facility in Tampa, Florida. It opened in 1926 under the name Tampa Downs. The first of many names, the racetrack was well known as Florida Downs. The track races from December until May. The main track is a one mile (1.6 km) dirt oval. The turf course is seven furlongs and includes a quarter mile inner chute. Tampa Bay Downs, which has long been famous as the only Thoroughbred race track on the West Coast of Florida, provides Bay area sports fans with live racing action from December through May. Tampa Bay Downs first opened its doors in 1926 under the name of Tampa Downs and has since amassed a long and colorful history. The founding operation was headed by Ohio investor Harvey Mayers and Kentucky Colonel Matt J. Winn. In 1946 the track was renamed Sunshine Park and entered the modern era with the installation of an electric starting gate, photo finish and electric tote board. During the 1950s, the racecourse was a popular attraction with many sportswriters who came to the Tampa Bay area to cover baseball spring training. Legendary names like Grantland Rice, Red Smith, and Arthur Daley became regular visitors, calling the track the "Santa Anita of the South." The year 1965 marked the third name change for the track when it opened as Florida Downs. 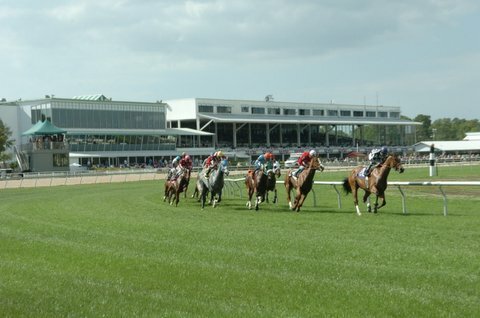 The track returned to its original name of Tampa Downs in 1980. On February 12, 1981, , then an apprentice jockey and now a U.S. Racing Hall of Fame inductee, got her first career victory here. In 1983 the track began running periodic Arabian horse races. The present owner, Stella F. Thayer, assumed the reins in 1986 and the track became known as Tampa Bay Downs. In 1998 Tampa Bay Downs added its 7/8-mile grass track, complete with a ¼ mile chute, which has become one of the most popular turf courses in North America. The course was completed in the spring of 1998 and the first race was contested on Kentucky Derby Day, May 2, 1998. This new avenue has provided more opportunities for the horsemen and patrons alike. Other renovations include a state-of-the-art 22-acre (89,000 m2) golf range called the Downs Golf Practice Facility, which includes a 270-yard (250 m) driving range, two in-house golf instructors as well as a wagering facility. When Tampa Bay Downs concluded its 81st season on May 6th, 2007, the track established new records in handle, attendance and purses paid, including an all-time attendance mark of 11,014 on Kentucky Derby Day, May 5, 2007, which featured Tampa Bay Derby winner Street Sense becoming the first graduate of the Tampa Bay Derby to win the Kentucky Derby. Tampa Bay Derby day also marked the Oldsmar oval's highest-ever handle, with $10,916,634 wagered on the Tampa Bay Downs signal on that day. Street Sense and Any Given Saturday were two of the notable horses who competed over the Tampa Bay Downs surface in the 2006-2007 racing season; they were joined by such notable horses as Cotton Blossom, Istan and Autobahn Girl. The Silks Poker Room opened during the 2004 season, and in June 2007 began operating on a year-round basis from 12:30 PM through 12:30 AM. Prior to the 2007-2008 meet, Tampa Bay Downs was awarded four Graded Stakes. The Grade III $300,000 Tampa Bay Derby and the Grade III $175,000 Hillsborough Stakes retained their distinctions, while the $200,000 Florida Oaks and the $150,000 Endeavour Breeders' Cup received Grade III status for the first time. Tampa Bay Downs' 82nd season was highlighted by records set in both attendance and out-of-state wagering handle. On Festival Day, March 15, 2008, a record 12,746 fans arrived at the Oldsmar oval to witness Big Truck capture the Grade III Tampa Bay Derby. Tampa Bay Downs had three Eclipse award winners attend the 2007-2008 meeting: Rosemary Homeister, Jr., who won the Outstanding Apprentice award in 1992, was a regular fixture in the Jocks' Room at the Oldsmar oval, finishing the season as the second leading rider overall. Dreaming of Anna, who was the Champion Juvenile Filly of 2006, swept both the Grade III Endeavour Breeders' Cup and the Grade III Hillsborough Stakes at the Oldsmar oval. War Pass, who was the 2007 Two-Year-Old Champion, competed in the Grade III Tampa Bay Derby. Before the 2007-2008 race meet began, Tampa Bay Downs underwent several renovations, including the installation of the Grandstand elevator; the all-new Silks Poker Room, located on the third floor of the Grandstand; the Party Suite, adjacent to the Silks Poker Room, was also updated with new flat-screen TVs installed. The Legends Bar, which includes a museum-quality exhibition of famed Thoroughbred Seabiscuit, became the newest feature of the second floor of the Grandstand. Horsemen enjoyed improvements to the Paddock area, with all-new stalls in the saddling barn ensuring the safety and comfort of horses and their connections. Other facility upgrades at the Oldsmar oval include a refurnished Racing Office on the backstretch, as well as a renovated track kitchen.